As Director of Student Affairs at Notre Dame’s London Global Gateway, I have been fortunate enough to share in many amazing experiences with our students during their semesters abroad. By far, though, one of the most rewarding things I have been part of is a trip to Bardejov, Slovakia, with 13 Notre Dame Juniors on November 2-5, 2017. Making the most of their time in London, these students are all undertaking internships at local Catholic secondary schools: St. Thomas More Language College and St. John Bosco College, which has a sister school in Bardejov. These placements combine with a weekly co-curricular class to form a three-credit course; ‘Catholic Education and the Common Good’ is taught in part by Simon Uttley, former Headmaster of St. John Bosco College in London and the driving force behind the Anglo-Slovak school partnership. 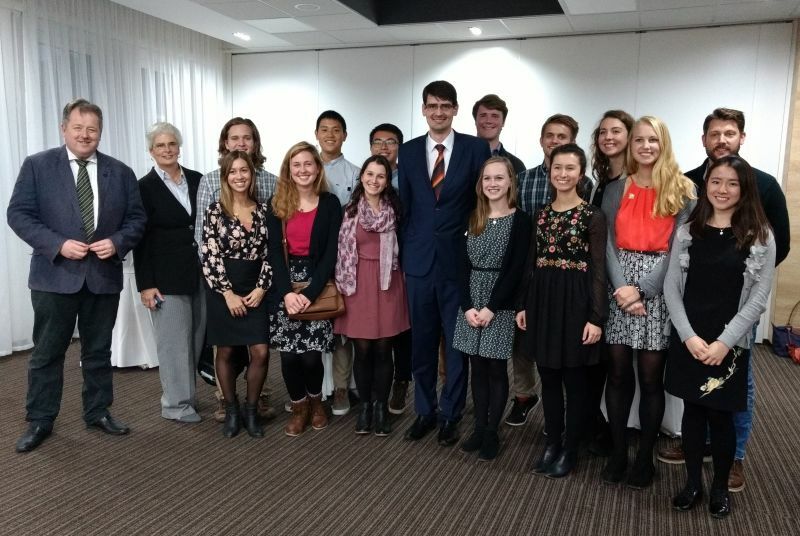 The trip to Bardejov – generously funded by Notre Dame’s Nanovic Institute for European Studies – saw these fortunate students take their study to the next level, learning about a Catholic education in a truly international sense. 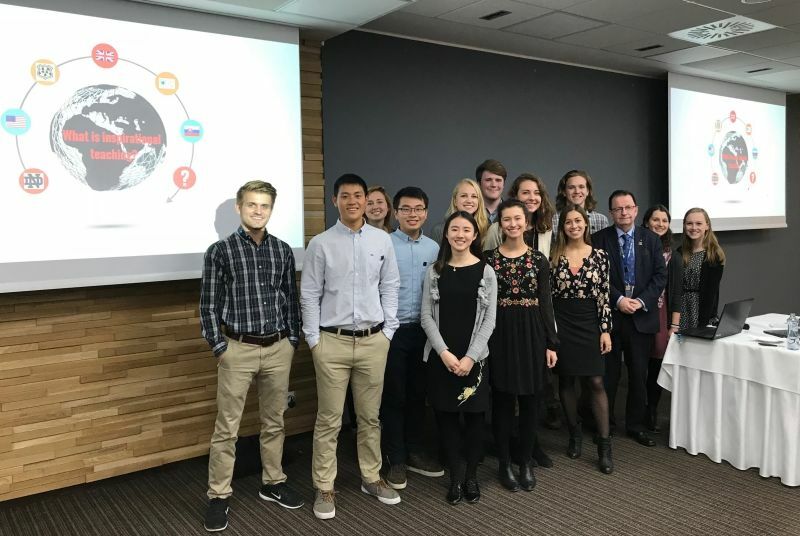 By engaging with students and teachers at two schools, and participating in an international conference of educators, the students gained insight into the development of Catholic education in a post-Soviet nation. It was my privilege to join this group as they pushed the boundaries of their study abroad experience and deepened their intercultural understanding, venturing beyond the typical tourist trail of Europe. Teší ma! Pleased to meet you! I always advise students that for an authentic study abroad experience, and true understanding of a culture and community, you have to delve beneath the surface. Meet the locals and do as they do; exchange knowledge, viewpoints, even jokes. I was delighted to see our interns embody this principle as we visited two schools in Bardejov, learning and laughing together and making new friends. 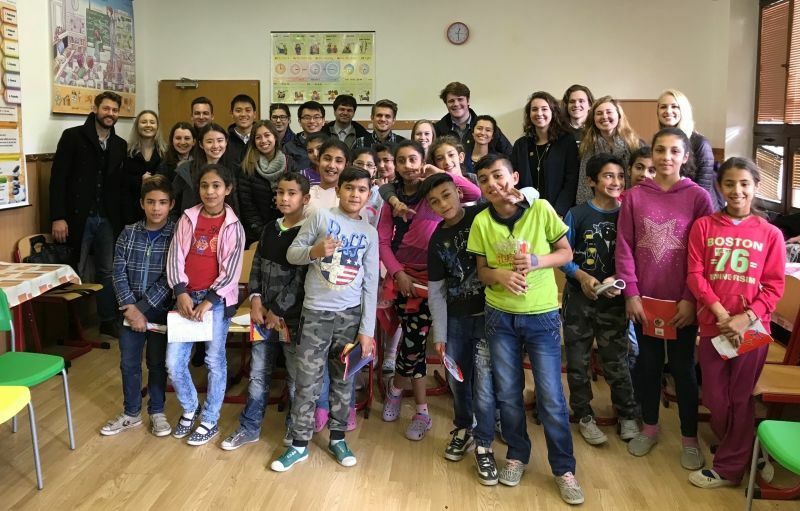 At the first, a Roma school, we were warmly welcomed by eager young pupils who had prepared questions to ask our students in English: “What is your favorite animal? What is your favorite sport?” One of our interns mentioned that he liked boxing and was coerced into doing 40 push-ups, counted in English by the Roma children! Another heartwarming moment was listening to the children sing to us and our students singing back the Alma Mater – it reminded me what a credit our interns are to Notre Dame and made me very proud. Martin Smilnak (Headteacher at St. John Bosco Gymnasium in Bardejov, also a regional Member of Parliament) and Fr. Peter (a Salesian priest at the Roma School) gave our students further insight into the Roma culture and community in Bardejov, explaining some of the difficulties they face due to discrimination and extreme poverty in the district of Postarka. Our students also attended Bardejov’s annual Go Bilingual conference, giving a confident and polished presentation on ‘Inspirational Teaching’ to roughly 60 Catholic educators from around the world – and guest of honor, Peter Krajnak, the Deputy Minister of Education for Slovakia. Recounting their experiences of education, including working in London schools as part of their internship program, the students discussed how inspirational educators had made a life-changing impact on them. ‘What is inspirational teaching?’ Our students discussed at the Go Bilingual conference. On Saturday, with all the work done, we took a trip to the gorgeous town of Kosice and enjoyed a cultural heritage tour. Several members of the group remarked how lucky they felt to have seen this town they might never have thought to visit otherwise; I counted myself amongst them. While our students frequently spend their weekends away on travels, exploring Europe’s offerings beyond the U.K., Slovakia may not have been on their list. The trip was an opportunity for them to go further, to think outside the box, and I believe they will return to Notre Dame with a much richer and deeper intercultural competency because of the experience. On behalf of the whole group, I must thank all faculty and staff members who supported this invaluable trip: Simon Uttley and John Lydon (who teach ‘Catholic Education and the Common Good’), Nick Brill (who manages the London Internship Program with me), and Monica Caro (Manager of Operations at the sponsoring Nanovic Institute for European Studies). Originally published by Rina Buznea at international.nd.edu on December 06, 2017.